Mandarin peel has long been used in Chinese cooking. It’s quite expensive though. So my mother used to make her own every year and keep them in large airtight jars. Mandarin peel is quite versatile and can be used in many different dishes and soups. Its aroma goes really well with sea food. I often use a small piece to steam fish or make Chinese dessert, such as my most favourite red bean and black glutinous rice sweet soup. 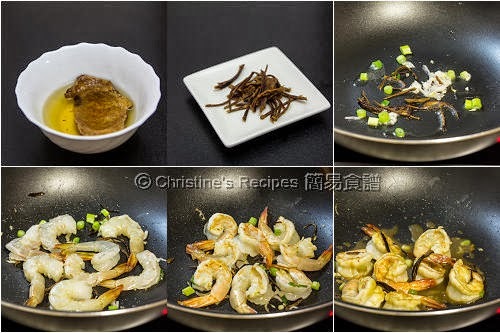 This time, I stir-fried some fresh prawns with my homemade mandarin peel. The dish was good as expected. One thing I might do differently next time is that I have to double the size at least. Well, this smaller portion could be served as an appetizer. Rinse the prawns and pat dry. Shell the prawns leaving their tails intact. Slightly cut along the back of the prawns about ½ cm deep, then devein. Mix with the seasonings. Set aside. Use a knife or spoon to scrape away the inner rind of the mandarin peel. Finely Shred. Heat oil in a frying pan over medium heat. Sauté the garlic, shallot, mandarin peel and white parts of spring onion until aromatic. Toss in the prawns. Cook until both sides start to change colour. (Remark: you don’t need to cook through the prawns at this stage.) Sprinkle wine and pour sauce. Quickly stir to combine. Cook until the prawns are just cooked. Remove from the heat and stir in the green parts of spring onion. Serve immediately. The water for soaking dried mandarin peel is very fragrant. The prawns will take up the subtle mandarin aroma. Prawns are quick to be cooked. Don’t over cook them. By cutting along the back of the prawns, they will curl up nicely after heated. 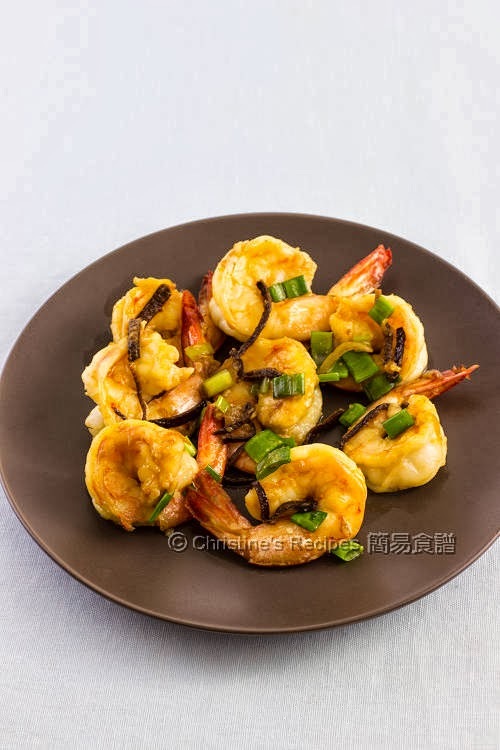 These prawns look so succulent and lipsmackingly delicious! over here, the mandarin peels are real cheap and yup, can diy too by sundrying. 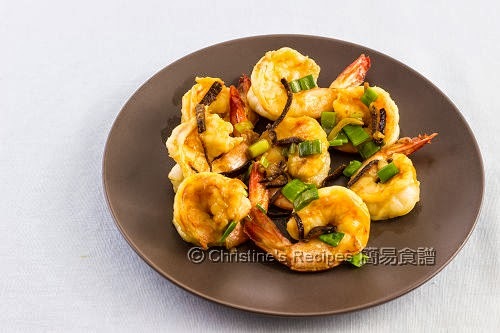 Love the golden hue of your prawns. The Mandarin peels make this an extra tantalizing and appetizing dish!